Chemists at UCLA have designed new organic structures for the storage of voluminous amounts of gases for use in alternative energy technologies. The research, to be published on April 13 in the journal Science, demonstrates how the design principles of reticular chemistry have been used to create three-dimensional covalent organic frameworks, which are entirely constructed from strong covalent bonds and have high thermal stability, high surface areas and extremely low densities. The team of researchers comprises chemists from the Center for Reticular Chemistry at UCLA’s California NanoSystems Institute and the departments of chemistry and biochemistry at UCLA. 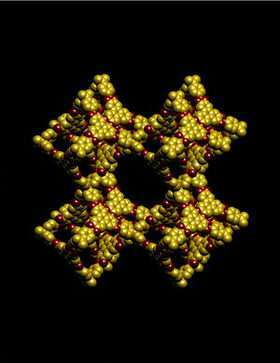 The covalent organic frameworks, or COFs (pronounced "coffs"), one of these new classes of materials, are the first crystalline porous organic networks. A member of this series, COF-108, has the lowest density reported of any crystalline material. COF-108, the latest advance in reticular chemistry development, has a high surface area, with more than 4,500 meters per gram. "One gram, unraveled, could cover the surface area of approximately 30 tennis courts," Yaghi said. In the push to develop methods to control greenhouse gas emissions, some of the biggest challenges have been finding ways to store hydrogen for use as a fuel, to use methane as an alternative fuel, and to capture and store carbon dioxide from power plant smokestacks before it reaches the atmosphere. Yaghi and his colleagues believe COFs are uniquely suited for all these applications because of their functional flexibility and their extremely light weight and high porosity.